“President Trump’s proposal for a follow-up summit this fall with Russian President Vladimir Putin is supported by a majority of Americans, according to a poll released Monday afternoon. The American Barometer poll, a joint project of The Hill and the HarrisX polling company, found that 54 percent of respondents back Trump’s plan for a second summit with the Russian leader, this time in Washington, D.C. Forty-six percent of respondents opposed the idea. The results were released Monday afternoon on Hill TV’s new polling show, “What America’s Thinking,” hosted by Joe Concha. The American Barometer will measure the public’s sentiment on various issues on a daily basis. The survey was conducted online July 21-22 among a randomly selected sample of 1,001 voters. The results were then weighted for age within gender, region, race/ethnicity, marital status, household size, income, employment, education, political party and political ideology where necessary to align respondents with the actual proportion of people with those traits in the overall population. Concha and a panel of polling experts said the poll results show that Americans can separate the nation’s long-term interests from the negative media coverage of Trump’s first summit with Putin in Helsinki last week. For instance, the poll found 60 percent of Americans disapproved of Trump’s handling of Russia in the aftermath [such as his embarrassing Deep State walk back] of the summit, but they approve of holding another summit, with 87 percent of Republicans and 54 percent of independents supporting another meeting with Putin. Added: Similar poll Feb. 15-19, 2017, McClatchy-Marist, poll, telephone interviews. “Poll: Majority of Republicans back Trump Russia policy,” 865 registered voters. “This survey of 1,073 adults was conducted Feb. 15-19, 2017, by The Marist Poll, sponsored and funded in partnership with McClatchy Voters had same view that US should have detente with Russia. 73% of Republicans favored detente: 73 percent, appear ready to dismiss [alleged congressional GOP] leadership’s concerns“ with GOP “decades old” policy of being anti-Russian. “The results reveal the challenge congressional Republicans face trying to maintain decades-old party principles concerning Russia, views that conflict with the president’s new objectives.”…This is proof if needed that US elections are a fraud for all the world to see and should be cancelled. The War Party wins–and they can’t tell you why–“it’s classified.” US taxpayers are slaves to the Endless Unwinnable War Industry. The US of course is in no position to advise others about anything. The US is no longer a country. It has open borders and fake elections. “Republicans remain firmly supportive of President Donald Trump’s overtures to Russia, even as the GOP’s congressional leaders are wary. A new McClatchy-Marist poll found large majority of Republicans, 73 percent, appear ready to dismiss [alleged] leadership’s concerns about getting too close to the [alleged] longtime adversary amid worries about alleged meddling of U.S. elections and the annexation of Crimea [following US engineered overthrow of Ukraine government]. Only 10 percent of Republicans actually think it’s a bad thing. Also telling is that an equal number of independents, 43 percent, think it’s as good idea as it is a bad idea to improve ties with Russia. The ranks of Republicans who feel Trump acted unethically, if not illegally, are in the single digits…. Congressional Republicans will want to be careful. More than 80 percent of Republicans don’t think Trump has done anything wrong. In fact, only 7 percent of Republicans think he might have done something unethical, but not illegal. Just 2 percent think he did something illegal. Michelle Preusch, a former corporate controller who now owns a jewelry business, feels some Republican leaders have tunnel vision and simply can’t let go of outdated policies. “While speaking to reporters at a press conference at the Capitol on Tuesday, Senate Majority Leader Mitch McConnell (R-KY) stated that both he and House Speaker Paul Ryan (R-WI) “have made it clear” that Vladimir Putin “will not be welcome” in the Capitol. McConnell was asked by one of the reporters about the merits of the White House’s invitation to Putin to visit the US. McConnell and Ryan are globalist pimps..period! Trump and Putin have all the dirt on the Deep State it’s no wonder they are pushing back so hard! Added: McConnell and Ryan were fine with selling one fifth of US uranium to Russia. And they had no problem when Putin endorsed Obama over Romney in 2012 noting Obama had said he’d give Russia more of what it wanted on the missile shield. They were fine that the corrupt US State Dept. had no IG during Mrs. Clinton’s entire 4 years there. “Republican leaders have for years failed to think about much of anything beyond winning the next election. Year after year, the party’s candidates promised help for middle-class people who lost their homes, jobs and savings to recession, who lost limbs and well-being to war, and then did next to nothing. “All the noise about Donald Trump’s “hostile takeover” of the Republican Party misses a key point: Such takeovers only succeed when existing management has failed massively. And that’s true of both the GOP and the conservative movement. Trump’s a disrupter — but most of the fire aimed his way is just shooting the messenger.Start with this: A few weeks ago, when Washington Post and New York Times reporters sought the Republican establishment’s reaction to Trump, the folks they dug up to talk to were a bunch of consultants and lobbyists. That is, mercenaries — guys who get paid, win or lose. They’re not (all) without principle, but they have a huge vested interest in the conventional fields and styles of combat that they’ve mastered — which earn them very, very good livings. Really, they’re no different from the lefty lobbyists now cashing in from their access to Mayor Bill de Blasio. And the Times-Post crowd wasn’t wrong: They’re the closest thing the GOP has to “wise men.” There are no sage party elders to go to. Cox is President Richard Nixon’s son-in-law; he’s been around Republican politics for five decades. If he says there’s no there there, there isn’t. Beyond the mercenaries, you’ve got a variety of pundits and talk-radio jocks — folks whose job is to entertain a (large) niche audience. They’re focused on their niches — and inevitably view the general interest of the GOP, as well as the nation, through those blinders. Much of the punditry’s now pointing Trump-blame fingers at the GOP “donor class” for leading the party astray — bribing pols to embrace open borders, avoid social issues, etc., etc. But the money men stumbled into this leading role because, ever since the Reagan years, the GOP regulars and the conservatives have been aiming for the Gipper’s second coming merely by imposing ever-stricter ideological tests. That has produced a stream of candidates competing over who can best mouth the catechism, plus somehow pick up enough other votes to take the White House. Today, the main alternatives to Trump are Ted Cruz and Marco Rubio — each a specialist in pushing one or another set of right-wing buttons. Cruz’s best real moment so far came when he talked about trying to get his sister out of that crack house — everything else is a rehearsed performance. Until last week, Rubio was just a smoother, more “uplifting” Cruz. Marco’s far more loose, authentic and appealing now that he’s trading low blows with Trump — he’s a real person, rather than some bizarre savant finding the right mini-speech in his memory. Maybe the change has come in time . . . Anyway, both offer pretty much the same “Unify the party and add a few more voters somewhere” strategy for the general election that’s been failing for the GOP since 1998. The one time it (barely) worked, we got Dubya. The big early achievements of the Bush presidency were, at best, technocratic, not conservative: No Child Left Behind, the new Medicare prescription drug entitlement and some temporary tax cuts. Then came 9/11 — and soon the best and the brightest of the Republican Party gave us the Iraq debacle (much as the Democrats’ best and brightest had given us Vietnam a generation before). After that, conventional GOP thinking gave us the John McCain and Mitt Romney nominations — neither a winner, nor even that good a competitor. And Romney actually tried to win by reaching out to the very same voters whom Trump’s now locked up, and by using the same issues: In 2012, Mitt was a hawk on immigration and on China trade — he just couldn’t make the voters believe it. I can’t say whether Trump will get my vote when the primaries come to our neck of the woods, but I don’t resent his existence or his success, nor blame him for destroying the GOP. 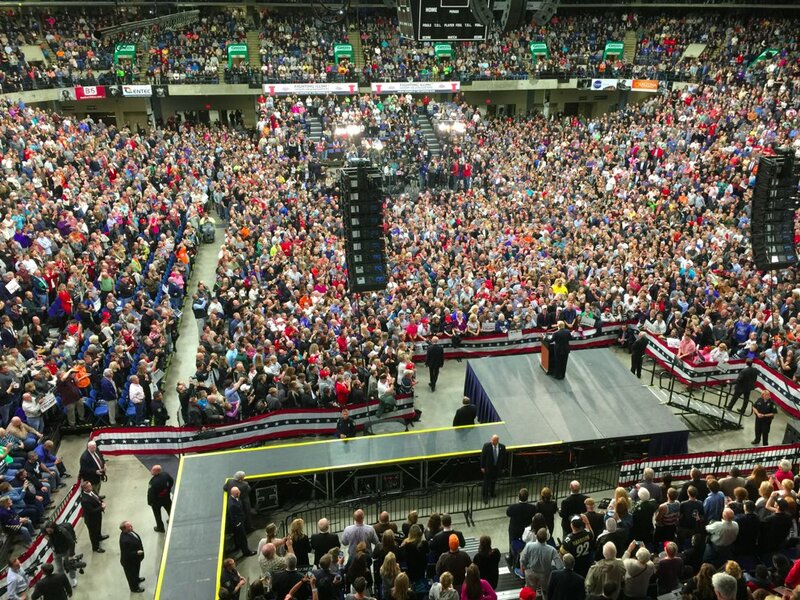 “He managed to prevail—to mount the most astonishingly successful insurgent campaign against a party establishment in our lifetimes….He won the GOP’s untapped residue of nationalist voters, in a system where the elites of both parties are, as if by rote, extreme globalists. He won the support of those who favored changing trade and immigration policies, which, it is increasingly obvious, do not favor the tangible interests of the average American. 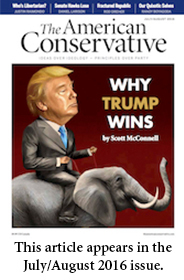 “National Review’s publication of the collective anti-Donald Trump missives from 22 self-appointed conservative potentates has caused quite a stir in Republican circles. The Gang of 22 have officially become parodies of themselves. One would have to reach back to the days of Richard Nixon and Spiro Agnew to lift an adequate quote to describe them. “Nattering nabobs of negativism,” “vicars of vacillation,” “pusillanimous pussyfooters,” “the decadent few,” “ideological eunuchs,” “the effete corps of impudent snobs,” or “the hopeless, hysterical hypochondriacs of history” – take your pick, because they all apply about equally well to each and every one of them. So clueless is the Gang of 22 they can’t even see how they’ve stumbled right into the narrative Trump’s been communicating so successfully for months. Just like the elected officials from both parties, the Gang of 22 has been GREAT at complaining about stuff, year, after year, after year. But getting anything accomplished? Not so much. Many of the Gang of 22 have been hanging around and chattering for decades, and some are active cogs in the Conservative Entertainment Complex, deriving their income by pandering to conservative anger while offering no real solutions. Jealousy is also seriously at work here. Trump is inspiring and exciting a broad spectrum of the country like no member of the Gang of 22 ever has, or ever will. In just seven months of campaigning, Trump already has more Americans listening to a Republican message than the entire Gang of 22 could muster over decades. Trump understands that before you can advance the ball, you have to convince people to take time from their busy lives to listen. No one on the GOP side since Ronald Reagan has accomplished that like Trump. 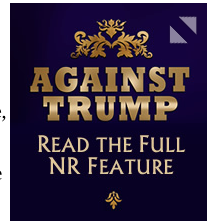 No one else has come close, and certainly no one from that “effete corps of impudent snobs” to which the National Review thinks we should defer. The Gang of 22 had their chance. They’ve done a lot of bitching over the years, and it paid well for some. But Americans care about results. They can plainly see that all of the empty talk from the Gang of 22 got us eight years of Barack Obama, and a loss in pretty much every conservative battle there was to lose. At the same time when Americans look at Donald Trump’s life they get a lot of assurance that here is finally a man who shares their focus on actually getting results. And Trump returns the respect by recognizing regular hard-working Americans are a lot smarter than any of the “ideological eunuchs” in all of their pontificating glory. The “pusillanimous pussyfooters” love to nitpick Trump’s words, but what voters are looking for this year is competence and accomplishment. Donald Trump has an actual record of delivering both in spades. The Gang of 22 is right to be terrified. A President who could get things done would expose them as the irrelevant creatures they truly are. 3/15/2016, “Rubio’s demise marks the last gasp of the Republican reboot,” Washington Post, Robert Costa, Philip Rucker, West Miami, Fla.
Years of carefully laid plans to repackage the Republican Party’s traditional ideas for a fast-changing country came crashing down here on Tuesday when Sen. Marco Rubio suspended his campaign for the presidency after a crippling defeat in his home-state primary. Since Mitt Romney’s devastating loss in the 2012 presidential election, the Republican National Committee and leading voices at think tanks, editorial boards and Capitol Hill symposiums have charted a path back to the White House based on inclusive rhetoric and a focus on middle-class issues. Nobody embodied that vision better than Rubio, a charismatic standard-bearer for conservative orthodoxy who readily embraced the proposals of the right’s elite thinkers. The senator from Florida spoke urgently and eloquently about raising stagnant wages and eradicating poverty. He had an immigrant’s tale to match the rhetoric. And on foreign affairs, he was a passionate defender of the GOP’s hawkish tilt. But Rubio’s once-promising candidacy, as well as the conservative reform movement’s playbook, was spectacularly undone by Donald Trump and his defiant politics of economic and ethnic grievance. The drift toward visceral populism became an all-consuming rush, leaving Rubio and others unable to adjust. Rubio’s fall comes weeks after others…dropped out of the race, and as the donors and institutions who have long supported hawkish fiscal and foreign policies find themselves scrambling to hold onto the consensus that has shaped the GOP for decades. For many of them, Trump represents a threat to the traditional order of the party and its platform. He does not support overhauling Social Security — a key plank for Romney and GOP congressional leaders — and he was a vocal critic of the 2003 invasion of Iraq in its aftermath, setting him apart from much of the party’s [self-appointed] high command. Rubio, whose ascent was propelled by a network of powerful players for years, was supposed to be the candidate best positioned to stop Trump and prevent a Republican rupture. The RNC drafted an “autopsy” that recommended bolstering appeals to women and minority voters [ie, Obama voters]…. Rubio had been building his base among these [Establishment] Republicans since January 2011, when he began his Senate term. He joined the Senate Foreign Relations Committee and began to speak at think tanks and meet with scholars, most of them former staffers from George W. Bush’s administration. He hired a number of them for his own staff. During his breaks in the Senate, Rubio would often tell colleagues how he was reading papers sent to him from former Republican officials or how he was about to have lunch with another bold-faced name from the Bush years. On his computer, he kept a “drop box” of related policy files compiled by his advisers…. (continuing): “Rubio followed a similar path with foreign-policy hawks as they began to look for a favorite ahead of the 2016 contest: a flurry of meetings and op-ed articles and, most critically, solidarity on the issues as they bubbled up. Although Rubio entered 2015 hobbled with parts of the GOP base because of immigration, he carried goodwill among those two constituencies that were driving the Republican establishment: the reformers and and the hawks. (continuing): “Former House speaker Newt Gingrich said that Rubio campaigned in a way that quickly became obsolete. “Rubio was prepared, much like Jeb Bush, for a reasonable dialogue in Washington policy language, offering positions that reflect 40 years of national security and foreign-policy experts. All of that disappeared. The market didn’t care,” Gingrich said. Rubio’s hawkish foreign policy footing, thought to be an asset, was challenged.Trump’s claims of being “militaristic” even though he was inclined against intervention muddled how voters perceived the candidates, disassociating American power with the hawkish ideology of Rubio and the Bush orbit. Trump’s denunciations of George W. Bush’s decision to go into Iraq did not make the hawkish cause any easier…. Whit Ayres, Rubio’s pollster, spent the past several years compiling data and published a book showing that Republicans could not afford to alienate minority voters, especially Hispanics, if they ever hope to retake the White House. Watching Rubio’s concession speech on Tuesday night, Ayres was despondent. Comment: Who is “we” Rubio’s pollster speaks of?